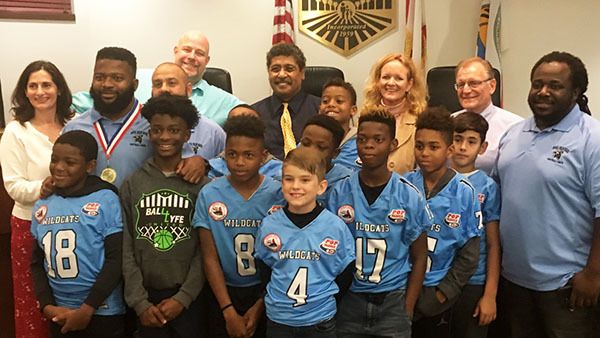 Council members congratulate the Royal Palm Beach Junior Pee Wee Football Team. The Royal Palm Beach Village Council meeting on Thursday, Jan. 17 included presentations concerning the needs of some of the community’s most senior members, as well as the recent successes of a group of young local football players who just won a national championship. Mary Kaminski leads the “seniors helping seniors” movement in Royal Palm Beach. At the council meeting, she spoke in her capacity as chair of the Royal Palm Beach Senior Referral Program. Kaminski reported on the new program’s early successes and hammered home to the council that there is a great need in the village for better transportation options for seniors. Volunteers with the Senior Referral Program have staffed a free help desk at the Royal Palm Beach Recreation Center every Tuesday and Thursday from 1 to 3 p.m. since last spring. The focus of the program is to provide a comfortable, caring environment for seniors to request help, assistance in determining which services might best fit their needs, help contacting the appropriate agency, department or person, and follow-up to ensure a suitable solution. The new program currently boasts 11 volunteers and has already helped scores of seniors. “One of our sadder cases was helping an elderly woman deal with the fact that her husband, afflicted with Alzheimer’s, had started to exhibit abusive behavior,” recalled Helen Benvenuto, a volunteer who staffed the help desk one recent Tuesday afternoon, along with Kaminski. In that case, the volunteers were able to let the woman know her options and connected her with the appropriate social services agency. According to Kaminski, the greatest obstacle facing some village seniors is the lack of transportation. Mayor Fred Pinto directed village staff to step up efforts to find viable solutions. Village Manager Ray Liggins said that his staff is working on the idea. In other news, the mayor and council congratulated the coach and players of the Royal Palm Beach Junior Pee Wee Football Team, whose 8- to 10-year-old players are now the national champions after defeating a team from Arizona in Orlando recently. Coach Sam Curry told the council how proud he was of his players and thanked the village for providing facilities that produced the national champions.